The Town Council of Sant Feliu de Guíxols undertook a policy of the protection of various building facades that configurated significantly the main avenue in the town in the XIX century. Among these facades with architectural heritage value are the Gorgoll and Santa Magdalena streets. These groups of houses are facades of houses with one single span constructed in mid XIX century as homes for the workers of the industries that were newly established in the town. This model of house is based on a facade which has a door leading to an entrance space and a window on the ground floor. On the higher part of the facade there is always an acroterion that avoids the view of the roof. The upper floor has a balcony with a forged metal handrail and a window that is occasionally simply marked. The lower part of the Santa Magdalena street took shape between 1889 and 1905 based on a drawing from 1858 of the construction foreman Josep Gallart. 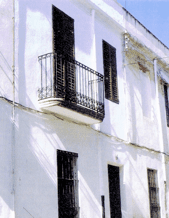 In 1889 this group of semi detached houses was built, according to the design of the architect Manuel Almeda, author of various constructions of interest in the province of Girona in those years. The houses were related to the proximity to the industrial buildings. The type of house introduced was the single span house with ground and first floor and a width of approximately 6 metres, designated to serve as residence for the workers and without many variations; and this has given the homogeneity to the current image of this section of the street. L’Estudi de Detall té la voluntat de preservar les tipologies arquitectòniques del conjunt edificat i ordenar els futurs creixements del sector. El document proposa una actuació específica que es pot sintetitzar en els punts següents: es conserva l’alçada actual de les cases del front obligant els creixements de la planta segona a recular respecte la façana, no es contempla la possibilitat d’obrir portes de garatge ni de modificar les actuals obertures de façana i per a cadascuna de les finques es preveuen unes especificacions tècniques a complir, que es detallen en uns quadres adjunts.